Modern and stylish apartment equipped with every comfort and a good atmosphere. Excellent location with parking at the door. Bedroom with a large comfortable divan bed, complete with a makeup table and sloel, a large mirror, easy lounger and a small built-in cupboard. This room has a quiet air conditioning ideal for those hot summer nights. Make yourself comfortable in the living room with sofa, a large LED TV with free on-demand movie offerings through digicorder, free WIFI, high speed internet, books and magazines. In addition free of charge upon arrival a bottle of chilled mineral water (1L) and a bottle of juice (1L), instant coffee, some Senseo coffee pads, tea and biscuits or snack. Bathroom with rain shower (hot / cold water), sink and toilet. Including each a fresh, soft towel set (plus shower gel / shampoo). There is a hairdryer, iron and ironing board. The terrace is perfectly suitable for a breakfast in the morning. The sofa in the living room easily converts to an extra bed. The apartment has its own entrance. Also removed a stone's throw is the new football stadium of Ghent Ghelamco Arena, sports centers include Blaarmeersen, University Hospital, Flanders Expo, several business centers, the University of Ghent. We have near a Sunday market, a flea market, several theaters, cinemas, zwemkom etc. Ghent is a beautiful historic town, perfect for shopping, visiting museums, stroll or eat out. Due to its location Ghent is ideally located to visit other cities such as Bruges, Brussels and Antwerp or even Lille in France. These are all reachable in about 40 minutes by train or car. The Brussels International Airport can be reached in 45 minutes by car car, taxi, airport shuttle or train. During office hours we can offer office services: print / scan / fax / copy / email / phone or other office services. Usually there is parking available in front of the house for only € 5 per 24 hours and free on Sundays and holidays. In addition, we own free parking. 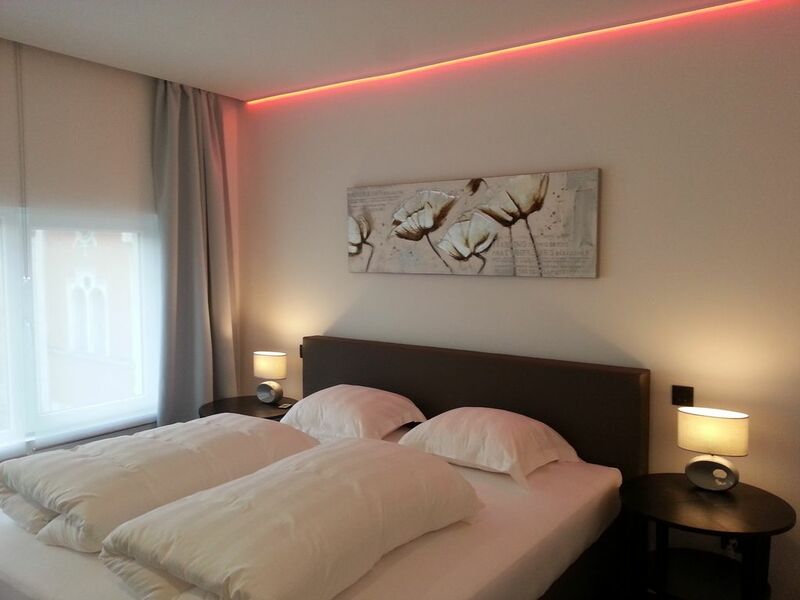 Located in the city center of Ghent, this apartment is perfect for either a short or long stay in this beautiful city. It is located near the south park in an easy to find nearby. Shops, museums, cafes and most attractions can be reached within 10 to 15 minutes walking distance. If you prefer to take public transport, the apartment is located less than 80 meters from all major bus and tram lines. I'm an open minded, very busy entrepreneur who like to make things convenient for other people. I'm curious about other cultures, I love to travel to Thailand. Before I was a real party animal, nowadays I'm more into dining and wining with friends or easy at home. My favorite seven lovely logics: 1. Make Peace with your Past so it doesn’t spoil your Present. 2. What others Think of you is None of your Business. 3. Time Heals Almost Everything, Give the Time, Some Time. 4. No one is the Reason of your Happiness Except You yourself. 5. Don’t compare your Life with others, You have No Idea what their journey is all about. 6. Stop Thinking too much, It’s alright not to know all the Answers. 7. Smile, you don’t own all the Problems in the World. Very simple and clean. Joost, a nice guy, lives next door and was very kind to two stupid guests who locked themselves out and had to call him on Sunday morning to get back in. The apt is maybe 10 minutes' walk from the beautiful center of town on a reasonably quiet street. We had a terrific time in Ghent. Very nice place, owner and location! A very nice apartment with the master bedroom and bathroom on the upper floor and the living room (including a comfortabele couch that can be transformed into a bed) and the kitchen on the floor below (the entrance is on the lowest floor). We had a warm welcome in a very clean apartment with some groceries in the kitchen (coffee, water, some cookies). Very nice! We stayed three nights with two young children and there was a baby bed for the toddler. The staircase is right in between the bathroom and bedroom without any door, so children should be looked after upstairs, to not fall down the stairs. The apartment is near a relatively busy road but you cant hear that inside when the windows are closed. And it's about a 25-minute walk to the city center. Dag Suzanne, hartelijk dank voor deze mooie review! We met Joost at his business next door, parked our rental car right in front (free parking), and were able to check in early. Everything was spotless, nice sized kitchen, comfortable living room, excellent bed, and amazing bathroom. There were no surprises. HIs maps of the city were very useful as we explored the neighborhood and Ghent Centrum. We walked everywhere, buses were available nearby though. A small grocery was nearby for meats, cheeses, and wine. Recommend this place without hesitation. Hi Michael, thanks for this nice review! Hope to see you again. Joost. The apartment was clean. We were able to get in easily even when we arrived later than expected. Close to tram and bus stops. Only 15 minute walk to city center. Great property, very good location. Joost works nearby, he is very helpful and always available. We definitely recommend it. Pristine contemporary apartment - better than expected. Mood lighting made the property magical and the town was amazing at Christmas. Situated in the city center of Gent, this apartment Provides a convenient location for a short or long stay in this beautiful historical city. The apartment is situated near the South Park in an easy to find neighborhood. Shops, museums, bars, restaurants and all major sightseeing attractions are within 10 to 15 minutes walking distance. If you prefer public transport, this cozy apartment is just 80 meters away from all major bus and tram lines. Ghent is a beautiful historic city, good for shopping, wining and dining. The central location of the city is an ideal base for visiting other cities like Bruges, Brussels and Antwerp. All accessible within 40 minutes by train. Even Brussels International airport can be Reached within 45 min. By car, taxi and train. Prices are for 2 guests, we charge for each extra guest € 15 /night Cleaning € 30 /stay or /week (not included in the daily rent). Prices include 6% VAT. Tourist tax € 3 /guest /night (under 18 y.o. no charge).